As part of The Schoolhouse Review Crew, I received The Sugar Creek Gang Audio CD Volume One from Beloved Books to review. Beloved Books offers many, many audio versions of books many families already know and love. Some in mp3 format, others on CD, and some on cassettes, also. There are Bible Memory audios, missionary stories, and G.A. Henty audio stories. 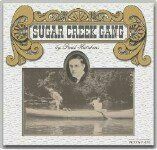 Also included are The Sugar Creek Gang audios that i’m reviewing today. My 12 year old son loves The Sugar Creek Gang and I can not keep enough of these books in stock for him. Some of my other kids loved them, too. We’ve also enjoyed watching The Sugar Creek Gang on tv. Zach was so excited to see these cd’s. I didn’t tell him they were coming, I just let him open the package when it came in the mail. Each story is on 2 cds, so there are 12 cds included in this set. The packaging is a very nice hard case with vinyl pockets for the cds. This audio version of The Sugar Creek Gang stories is very well done. They are true to the books, with no added background music or other noises. Listening to these cd’s was one thing I did not have to remind my son to do. He would put them in on his one and listen to them himself. Some days, Zach would listen to two cds. He really loved them.